Diddy Detectives Key Stage 1. 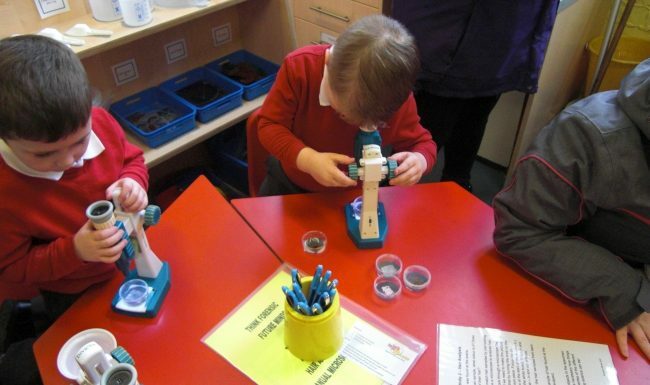 Diddy Detectives is designed not only to enhance scientific knowledge but also provide an extension to the maths, literacy, PHSE and life skills curriculum. Students are tasked with solving a mystery. Throughout the course of the sessions they will eliminate suspects to reveal the culprit. Rookie CSI Key Stage 2. A crime has happened in school. Your students will be tasked with hunting down the criminal. They will be issued with their own CSI suit and will use real life crime investigation techniques and equipment to eliminate suspects. These sessions are very popular and are often over subscibed. The sessions are delivered by our specially trained staff and include a mixture of STEAM subjects. Each funb, interactive session is designed to stimulate and re-new interest in STEAM subjects. Perfect for all ages, suitable for all learning capabilities, and affordably priced, there’s little wonder our science clubs are so popular. THINK FORENSIC STAFF ARE FULLY TRAINED, DBS CHECKED AND AWARE OF CHILD PROTECTION ISSUES. THE COMPANY IS FULLY INSURED. WE PROVIDE RISK ASSESMENTS AND SCHEMES OF WORK.